Pamine® 2.5 mg/Pamine® Forte 5 mg Tablets contain methscopolamine bromide, an anticholinergic, which occurs as white crystals, or as a white odorless crystalline powder. Methscopolamine bromide melts at about 225°C with decomposition. The drug is freely soluble in water, slightly soluble in alcohol, and insoluble in acetone and in chloroform. The chemical name for methscopolamine bromide is 3-Oxa-9-azoniatricyclo [3.3.1.02,4]nonane, 7-(3-hydroxy-1-oxo-2-phenylpropoxy)-9, 9-dimethyl-, bromide, [7(S)-(1Î±, 2Î², 4Î², 5Î±, 7Î²)]- and the molecular weight is 398.30. Pamine® 2.5 mg Tablets for oral administration contain 2.5 mg of methscopolamine bromide. 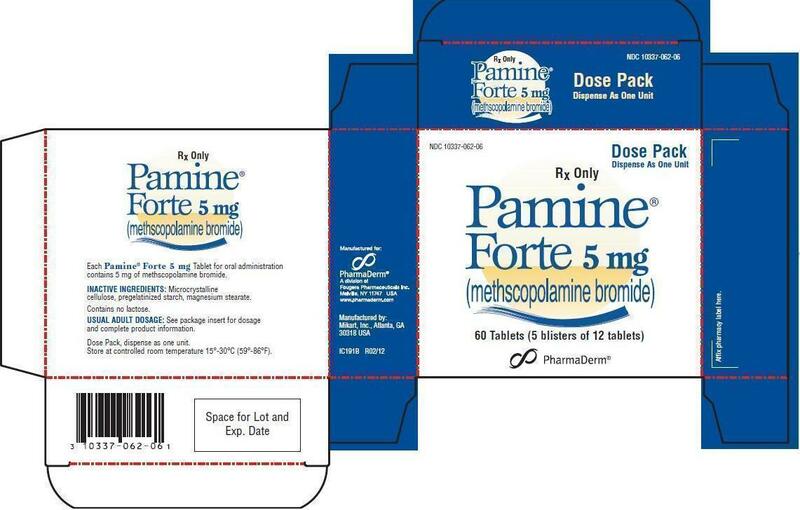 Pamine® Forte 5 mg Tablets for oral administration contain 5 mg of methscopolamine bromide. Inactive ingredients: microcrystalline cellulose, pregelatinized starch, magnesium stearate. Methscopolamine bromide is an anticholinergic agent which possesses most of the pharmacologic actions of that drug class. These include reduction in volume and total acid content of gastric secretion, inhibition of gastrointestinal motility, inhibition of salivary excretion, dilation of the pupil and inhibition of accommodation with resulting blurring of vision. Large doses may result in tachycardia. Adjunctive therapy for the treatment of peptic ulcer. METHSCOPOLAMINE BROMIDE HAS NOT BEEN SHOWN TO BE EFFECTIVE IN CONTRIBUTING TO THE HEALING OF PEPTIC ULCER, DECREASING THE RATE OF RECURRENCE OR PREVENTING COMPLICATIONS. Glaucoma; obstructive uropathy (e.g., bladder neck obstruction due to prostatic hypertrophy); obstructive disease of the gastrointestinal tract (e.g., pyloroduodenal stenosis); paralytic ileus; intestinal atony of the elderly or debilitated patient; unstable cardiovascular status in acute hemorrhage; severe ulcerative colitis; toxic megacolon complicating ulcerative colitis; myasthenia gravis. Pamine® 2.5 mg/Pamine® Forte 5 mg is contraindicated in patients who are hypersensitive to methscopolamine bromide or related drugs. In the presence of high environmental temperature, heat prostration (fever and heat stroke due to decreased sweating) can occur with drug use. Methscopolamine bromide may produce drowsiness or blurred vision. The patient should be cautioned regarding activities requiring mental alertness such as operating a motor vehicle or other machinery or performing hazardous work while taking this drug. With overdosage, a curare-like action may occur, i.e., neuromuscular blockade leading to muscular weakness and possible paralysis. Use Pamine® 2.5 mg/Pamine® Forte 5 mg Tablets with caution in the elderly and in all patients with: autonomic neuropathy; hepatic or renal disease; or ulcerative colitis â€“large doses may suppress intestinal motility to the point of producing a paralytic ileus and for this reason precipitate or aggravate "toxic megacolon," a serious complication of the disease. The drug also should be used with caution in patients having hyperthyroidism, coronary heart disease, congestive heart failure, tachyrhythmia, tachycardia, hypertension, or prostatic hypertrophy. Progress of the peptic ulcer under treatment should be followed by upper gastrointestinal contrast radiology or endoscopy to insure healing. Stool tests for occult blood and blood hemoglobin or hematocrit values should be followed to rule out bleeding from the ulcer. Additive anticholinergic effects may result from concomitant use with antipsychotics, tricyclic antidepressants, and other drugs with anticholinergic effects. Concomitant administration with antacids may interfere with the absorption of methscopolamine bromide. Animal reproduction studies have not been conducted with methscopolamine bromide. It also is not known whether methscopolamine bromide can cause fetal harm when administered to a pregnant woman or can affect reproduction capacity. Methscopolamine bromide should be given to a pregnant woman only if clearly needed. It is not known whether this drug is excreted in human milk. Because many drugs are excreted in human milk, caution should be exercised when methscopolamine bromide is administered to a nursing woman. Anticholinergic drugs may suppress lactation. The following adverse reactions have been observed, but there is not enough data to support an estimate of frequency. Allergic: Severe allergic reaction or drug idiosyncrasies including anaphylaxis. CNS: Headaches, nervousness, mental confusion, drowsiness, dizziness. Special Senses: Blurred vision, dilation of the pupil, cycloplegia, increased ocular tension, loss of taste. Renal: Urinary hesitancy and retention. Gastrointestinal: Nausea, vomiting, constipation, bloated feeling. Dermatologic: Decreased sweating, urticaria and other dermal manifestations. Miscellaneous: Xerostomia, weakness, insomnia, impotence, suppression of lactation. The symptoms of overdosage with Pamine® 2.5 mg/Pamine® Forte 5 mg Tablets progress from intensification of the usual side effects to CNS disturbances (from restlessness and excitement to psychotic behavior), circulatory changes (flushing, fall in blood pressure, circulatory failure), respiratory failure, paralysis, and coma. Measures to be taken are (1) induction of emesis and (2) injection of physostigmine 0.5 to 2 mg intravenously, and repeated as necessary up to a total of 5 mg. Fever may be treated symptomatically (alcohol sponging, ice packs). Excitement of a degree which demands attention may be managed with sodium thiopental 2% solution given slowly intravenously or chloral hydrate (100-200 mL of a 2% solution) by rectal infusion. In the event of progression of the curare-like effect to paralysis of the respiratory muscles, artificial respiration should be instituted and maintained until effective respiratory action returns. The oral LD50 in rats is 1,352 to 2,617 mg/kg. No data is available on the dialyzability of methscopolamine bromide. The average dosage of Pamine® Tablets is 2.5 mg one-half hour before meals and 2.5 to 5 mg at bedtime. A starting dose of 12.5 mg daily will be clinically effective in most patients without the production of appreciable side effects. If the patient is experiencing symptoms such as severe abdominal pain or cramping which demand prompt relief, the drug may be started on a daily dosage of 20 mg, administered in doses of 5 mg one-half hour before meals and at bedtime. If very unpleasant side effects develop promptly, the daily dosage should be reduced. If neither symptomatic relief nor side effects appear, the daily dosage may be increased. Some patients have tolerated 30 mg daily with no unpleasant reactions. Patients whose dosage has been reduced to eliminate or modify side effects often continue to show adequate response both subjectively in relief of symptoms and objectively as measured by antisecretory effects. The ultimate aim of therapy is to arrive at a dosage which provides maximal clinical effectiveness with a minimum of unpleasant side effects. Many patients report no side effects on a dosage which gives complete relief of symptoms. On the other hand, some patients have reported severe side effects without appreciable symptomatic relief. Such patients must be considered unsuited for this therapy. Usually they have been or will prove to be similarly intolerant to other anticholinergic drugs. If methscopolamine bromide is to be used in a patient who gives a history of such intolerance, it should be started at a low dosage. Store at controlled room temperature 15°-30°C (59°-86°F). KEEP THIS AND ALL MEDICATIONS OUT OF THE REACH OF CHILDREN. Gilman A, Gilman AB, Goodman LA, eds. 6th ed. New York: MacMillan Publishing Company.1980. American Hospital Formulary Service. American Society of Hospital Pharmacists. Bethesda, Maryland. Domino EF, Corasen G. Central and Peripheral Effects of Muscarinic Cholinergic Blocking Agents in Man. Anesthesiology 1967;28:568-574. Mogensen L, Orinius E. Arrhythmic Complications after Parasympathetic Treatment of Bradyarrhythmias in a Coronary Care Unit. Acta Med Scand 1971;190:495-498. Neeld JB Jr., et al. Cardiac Rate and Rhythm Changes with Atropine and Methscopolamine. Clin Pharmacol Ther 1975;17(3):290-295. A division of Fougera Pharmaceuticals Inc.